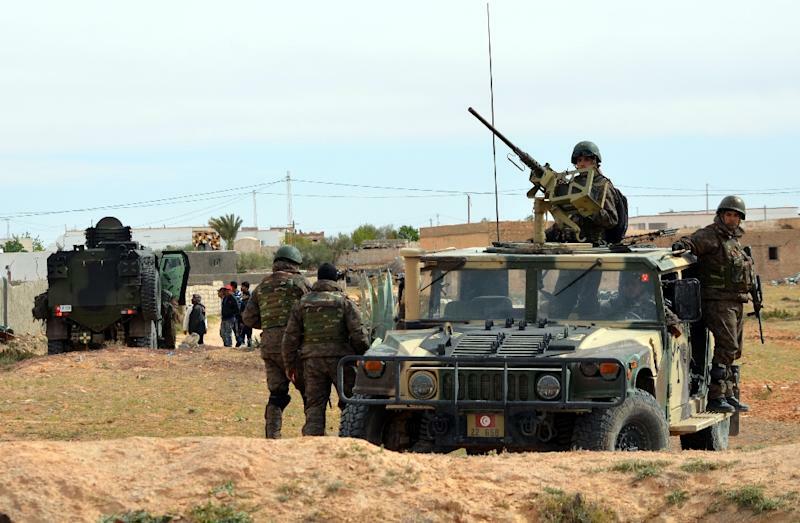 Tunis (AFP) - Tunisian forces killed five "terrorists" in an operation near the Libyan border late Tuesday, the interior ministry said, a day after a deadly raid the government has described as an unprecedented assault by the Islamic State group. The swoop by the army and security forces came after 17 suspects were arrested earlier in a manhunt following Monday's dawn attacks in the border town of Ben Guerdane, which left dozens of jihadists dead. "As part of the continuing operation at Ben Guerdane, security forces and the army were able to eliminate five terrorists tonight in the Benniri area," the ministry said in a statement, adding that weapons had been seized. Local media had reported that security forces had surrounded a house where several men were holed up, information that was not confirmed in the brief ministry statement. Analysts said Monday's coordinated attacks showed jihadists are keen to spread their influence from Libya to Tunisia and to set up a new stronghold in the country. Prime Minister Habib Essid said about 50 extremists were believed to have taken part in the dawn attacks on an army barracks and police and National Guard posts in Ben Guerdane. He said 36 attackers were killed and seven captured in a fierce firefight that also saw the deaths of seven civilians and 12 security personnel. Defence ministry spokesman Belhassen Oueslati said 17 other suspects were arrested on Tuesday near a military barracks and handed over to the National Guard for questioning. Essid said the militants "murdered one internal security force member in his own home" and that three civilians and 14 security personnel were also wounded. "The (security forces') reaction was rapid and strong. We won a battle and are prepared for any others," he said. 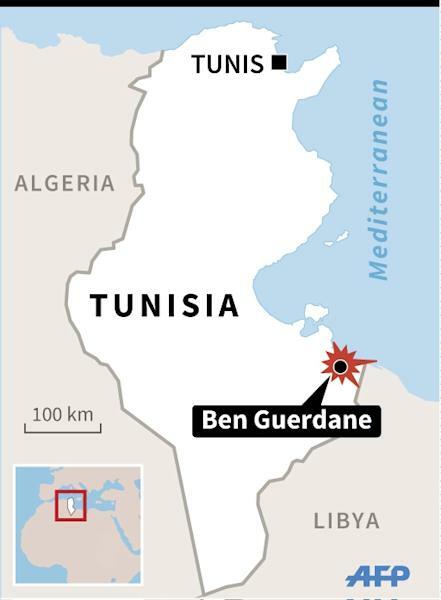 "Now they know Tunisia is no easy pushover and that it is not so simple to set up an emirate in Ben Guerdane." On Monday, Essid said the operation's aim had been to create a "Daesh (IS) emirate" in the town. Michael Ayari of the International Crisis Group think tank agreed, saying the attacks were an "extension of the armed conflict so far confined to Libya". Some IS jihadists "consider that Ben Guerdane could become a strategic 'liberated' zone that would include southeastern Tunisia and the Tripoli region", he said. Tunisian authorities had said search operations were continuing in the region on Tuesday and that a night-time curfew imposed in the town after the attack had been well respected. However, witnesses spoke of sporadic gunfire during the day as police and soldiers flooded Ben Guerdane. The walls of one building in which attackers had been holed up were riddled with bullet holes. Essid called for vigilance and promised a full investigation. "There are lessons to be learned from this terrorist attack. There will be a thorough assessment of what happened, and we will draw all the conclusions," he said. "It may be that there was a failure at a certain level, that of intelligence, other elements." President Beji Caid Essebsi has described the attack on Ben Guerdane as "unprecedented" and said it was "maybe aimed at controlling" the border region, vowing to "exterminate these rats". Residents said the assailants appeared to be natives of the region. They stopped people, checked their ID cards apparently to seek out members of the security forces, and announced their brief takeover of Ben Guerdane as "liberators". It was the second clash in the border area in less than a week as Tunisia battles to prevent the large number of its citizens who have joined IS in Libya from returning to carry out attacks at home. Two deadly IS attacks on foreign tourists last year that have dealt a devastating blow to Tunisia's tourism industry are believed to have been planned from Libya. Jihadists have taken advantage of a power vacuum in Libya since the NATO-backed overthrow of longtime dictator Moamer Kadhafi in 2011 to set up bases in several areas, including near Sabratha.